This sturdy shower chair rotates a full 360 degrees to give you more freedom to move in your tub or shower area. No tools are required to assemble it. Easy! The handy storage shelf provides easy access to all of your shower necessities including soap and shampoo. You can even convert it from a rotating stool to a stationary one by using the convenient locking mechanism. 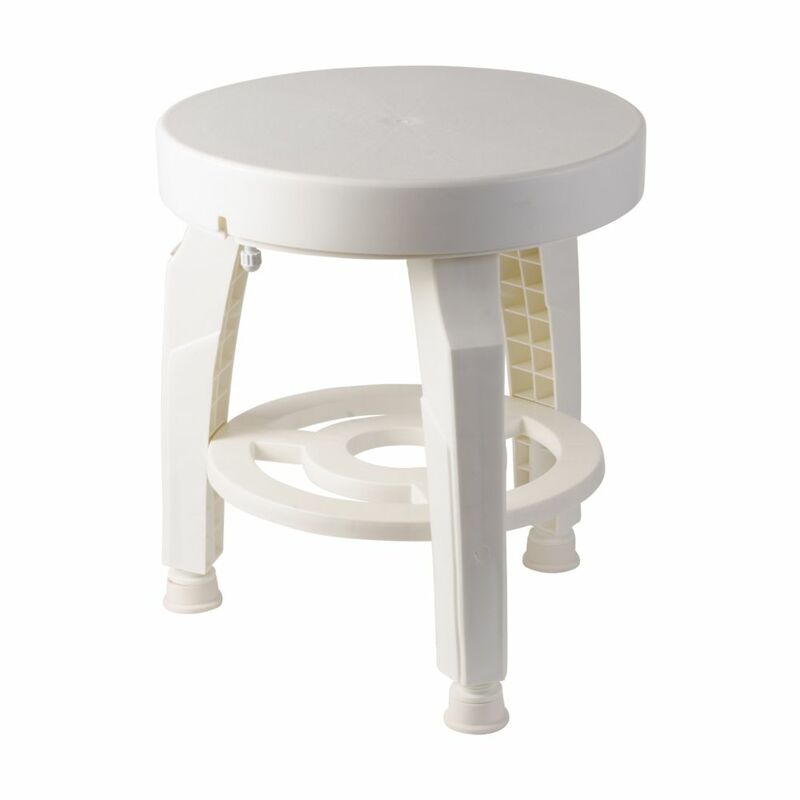 Feel free to adjust the height of this stool to meet your personal needs. It is sturdy enough to support up to 400 pounds. This attractive shower stool features BactiX natural antimicrobial protection that helps shield against odours, moulds and bacteria. This protection lasts for the life of the product to help ensure a safer bath environment for you and your family. Germ-free protection shields against odours, moulds and bacteria. The protection lasts for the life of the product. Handy storage shelf provides easy access to all of your shower necessities. Locking mechanism converts this bath stool from a rotating chair to a stationary chair. Pamper your legs and feet with the SMART Foot Seat. The sleek corner-fit design provides an ideal space-saving seating solution in any shower. With strong and durable rust-proof aluminum legs and anti-slip rubber feet, the SMART Foot Seat is as safe as it is chic. Engineered to ensure a proper fit on one- and two-piece toilets, this Brevia seat complements a wide variety of round-front toilet designs. Sturdy plastic construction resists staining, chipping, and fading, while the ergonomically contoured seat enhances comfort. This seat features innovative technology that simplifies both cleaning and installation. With one-piece, easy-to-clean construction, this Echelon shower seat offers a relaxed, functional solution for those who need or prefer to sit down while showering. This aesthetically pleasing seat with an integrated tile-in flange integrates smoothly with a range of structures. Available with a one year limited warranty. 360 Degree Swivel Bath Seat This sturdy shower chair rotates a full 360 degrees to give you more freedom to move in your tub or shower area. No tools are required to assemble it. Easy! The handy storage shelf provides easy access to all of your shower necessities including soap and shampoo. You can even convert it from a rotating stool to a stationary one by using the convenient locking mechanism. Feel free to adjust the height of this stool to meet your personal needs. It is sturdy enough to support up to 400 pounds. This attractive shower stool features BactiX natural antimicrobial protection that helps shield against odours, moulds and bacteria. This protection lasts for the life of the product to help ensure a safer bath environment for you and your family. 360 Degree Swivel Bath Seat is rated 3.6 out of 5 by 9. Rated 1 out of 5 by HomeDepotCustomer from seat did not swivel if you seat on it. ... seat did not swivel if you seat on it. Rated 5 out of 5 by Thomas from Well made and easy to assemble.... Well made and easy to assemble. Rated 5 out of 5 by Anonymous from Just what I wanted Fits smaller tubs, swivel top can be locked, looks ok sitting outside of tub too. Rated 5 out of 5 by Jo44 from good purchase and reasonably priced The shower swivel stool was somewhat difficult to assemble. But, once we figured it out, we got it done and it is a good shower stool. Glad I purchased it. Rated 1 out of 5 by husband from Bad product do not buy This was to hold up to 400 lbs but collapsed under my wife who does nort weigh that much and she fell to the floor. She is handycapd and could not get up until she called me home from work.